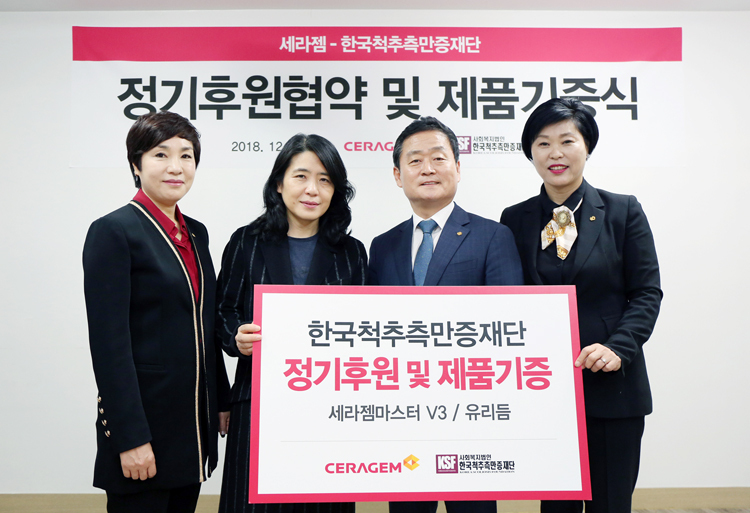 Ceragem, the global health care specialist, held a ceremony to execute the agreement for the donation of products and regular support with the Korea Scoliosis Foundation on the 4th. Ceragem donated 2 units of Ceragem Master V3, the thermal spine massager, and its representative product, and one unit of Youridm, the personal ultrasonic stimulator, and promised continued support for patients suffering from scoliosis through the agreement with the Korea Scoliosis Foundation. The President of the Korea Scoliosis Foundation, Cheon Eunmi, and officials of Ceragem participated in the ceremony. Scoliosis is a medical condition in which the spine has a sideways curvature and is twisted or curved due to various reasons. While the spine curvature is usually `S`shaped, scoliosis gradually develops during the growth period, around 10 years old, and due to the wide usage of computers and smartphones, it is aggravated during adolescence. 70% of patients suffer from idiopathic scoliosis, which appears without any specific reason. Moreover, there is functional scoliosis is caused by improper posture or habits or malnutrition and congenital scoliosis, which is caused by a congenital spine deformity. Besides this agreement for support, Ceragem has been implementing regular support for the Child Fund Korea for over 10 years and has taken part in a variety of social contribution activities in Korea including the Sharing Kimchi for Winter event, support for the shelter for foreign female workers, and regular volunteering service in social welfare facilities. As well as the social contributions in Korea, Ceragem has been engaged in a wide range of CSR (Corporate Social Responsibility) activities as the global leader abroad, including construction of the Small Hope School in China, the Dream School Project in India and the University Scholarship in Indonesia.